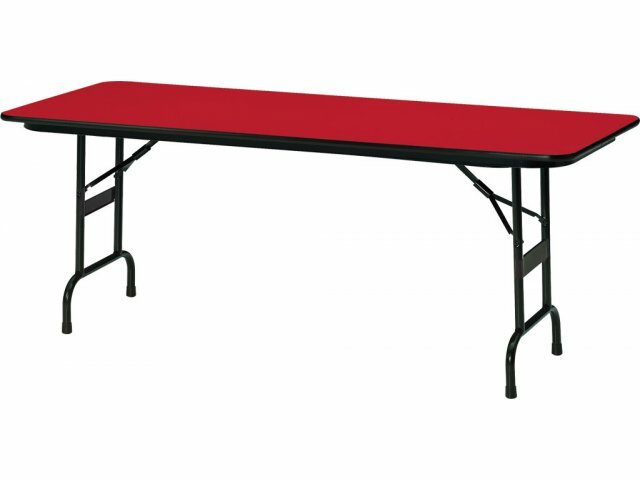 Colored School Folding Table - Leg Brace 96x36"
This folding table is perfect for small-group work. It seats eight people, which is great for study groups or small gatherings at lunch time. The Educational Color Top Folding Table is a popular bestseller that will brighten up any room or hall. With a selection of primary colors to choose from, you can coordinate with classroom and school colors, or take the opportunity to bring a splash of a vibrant new hue into your space. Versatile folding tables will come in handy virtually anywhere. These folding tables are as tough as they are visually-appealing. Their high-pressure laminate work surfaces are supported by 16-gauge steel legs with exclusive rigidity braces that make them super sturdy. 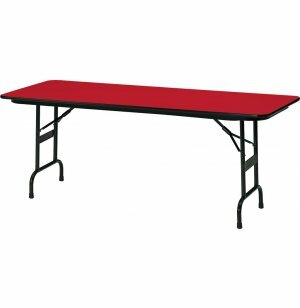 Black T-mold edge banding ensures that tabletops stay in shape so you can enjoy Correll folding tables for many years to come. Rounded bullnose edges prevent injury and offer greater durability. Reinforced Legs: Sturdy 16-gauge steel legs feature a gravity lock and exclusive rigidity braces which prevent buckling under excessive pressure. Smooth Surface: The solid 3/4"-thick core is covered by a high-pressure mar-resistant laminate surface. Easy Maintenance: The tabletop wipes clean with a damp cloth, saving you time and effort. Edge Protection: Black bullnose T-mold edge guards against chips, so your table will maintain its attractive appearance longer. Great Selection: Choose from an array of bright colors to liven up your space.